Bridges can be a great way to replace one or more missing teeth in the same area of your mouth. This is a permanent restoration which is held in place by crowns fitted over the adjacent or abutment teeth. These crowns are then attached to the replacement tooth or teeth which are called pontics. This also prevents the adjacent natural teeth from drifting. A bridge is a nice choice if you do not wish to have dental implants or a denture to replace your missing tooth or teeth. There are several different types of bridges that can be used as well as several different kinds of materials. We can discuss all these options with you so you can make the best choice for your dental health. We take enormous care when designing dental bridges and work closely with our dental laboratory to make sure you receive a high quality and natural looking restoration that should give you many years of use. There are several different types of bridges. Cantilever Bridge – This is a bridge with one replacement tooth or ‘pontic’ which is attached to one or more crowns on just one side of the gap.’ It is a useful solution if you only have suitable adjacent teeth on one side of the gap but is only suitable under certain circumstances. Fixed- Fixed Bridge – this is a traditional bridge that generally consists of two crowns, one crown either side of the gap and which are fitted over your natural teeth. These crowns are attached to a pontic or replacement tooth in the middle. 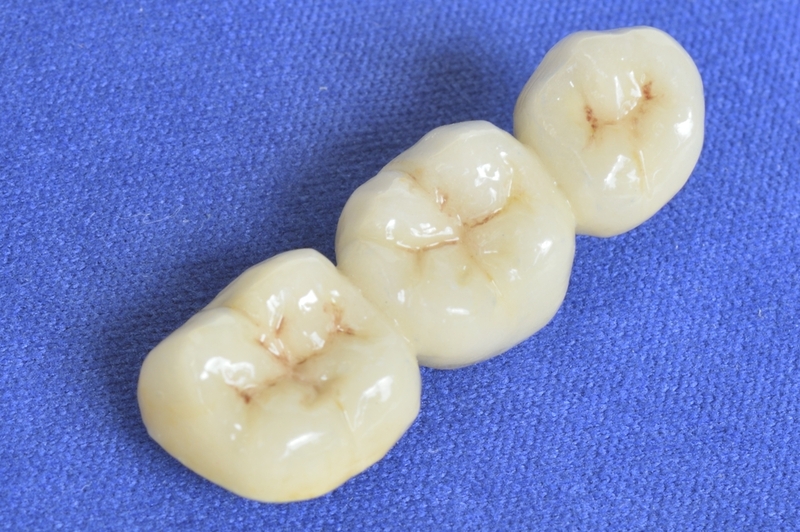 A fixed bridge can replace a far more than just one tooth and will often consist of several pontics joined together and which are supported by crowns on the abutment or adjacent teeth. Adhesive Bridge – This bridge has a replacement tooth (the pontic) to which a metal or tooth coloured ‘wing’ is attached, usually one either side of the pontic although occasionally only a single wing may be used. The wings are bonded onto the inner surface of a natural tooth on either side of the missing tooth and cannot be seen. An adhesive bridge can also be called a Maryland bridge and tends to only be used to replace front teeth as this type of bridge is likely to pop off if it comes under substantial pressure. 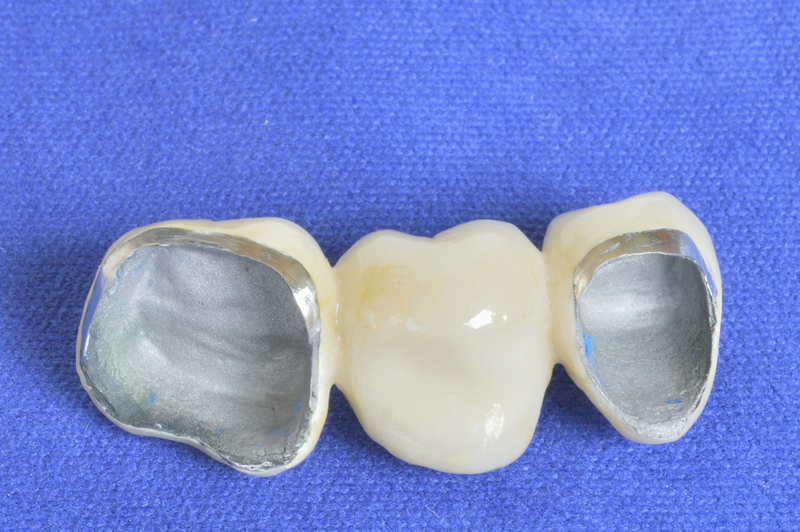 Dental bridges can be made from exactly the same kind materials used to make crowns. Your bridge can be all metal and will be made from top quality gold alloy that is highly polished, or it can have a gold substructure that is covered up with porcelain. Recent advancements in dental technology mean that we can supply you with all ceramic bridges that are incredibly strong and lifelike. The very latest all-ceramic materials are strong enough to support an entire arch of teeth. You will normally require two appointments for a bridge, the first is to prepare your teeth and the second is to fit your bridge. A local anaesthetic is used to numb the abutment teeth due to be crowned and surrounding gums. Our dentist will then carefully shape your abutment teeth, creating the correct shape to support the abutment crowns. An impression (mould) is taken of your teeth using special impression material that is normally silicon-based. The impression material is placed into a mouth tray which is then inserted into your mouth and is left to set before being removed. We will also need to take an impression of your opposing teeth, so the technician can see how you bite together and we may also get you to bite down on some dental wax to record your bite. While your new bridge is being made, we can supply you with a temporary bridge so there is no need to be concerned that we will leave you with a gappy smile. The impressions will be sent to the dental laboratory where our technician will handcraft your dental bridge using all the information provided. This will take between two and three weeks. A local anaesthetic may be needed to numb your teeth and surrounding gums although this isn’t often necessary. Your temporary bridge will be removed and the abutment teeth are cleaned to get rid of the temporary cement. Our dentist will then try in your new bridge, making sure that it fits correctly and that you are happy with the appearance. If necessary we can make any small adjustments before permanently cementing your bridge in position. We take enormous care when designing crowns and bridges and our dental laboratory only uses the highest quality materials to provide you with long-lasting and lifelike results.